"0:00-11:00 Sonic and Mega Man: Video Game Comics Showcase— Get your game on! Folks from the two most popular video game comic series share what’s in store in one, must-attend panel! 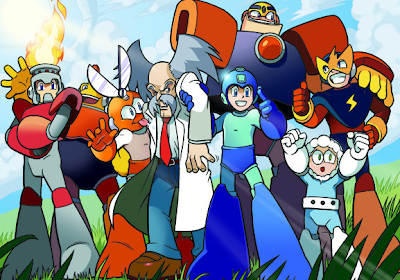 Learn what’s on tap for Sonic the Hedgehog, Sonic Universe, and Mega Man. The editorial mastermind behind both books, Paul Kaminski, is joined by Archie Comics president Mike Pellerito, artist Evan Stanley, and Archie Comics executive director of publicity and marketing Alex Segura. See some exclusive artwork, learn about upcoming storylines, and get a glimpse at the biggest comic book event of the year. We. Are. Not. Kidding. Be there! Room 24ABC"
The San Diego Comic Con will be held this year from July 12th to July 15th. Oh. My. God. PLEASE let it be what I think it is. While I like both Sonic and MegaMan, the idea of a crossover doesn't hype me all that much. It'd be alright, but not really something I'd want a whole season of. I wish Archie was coming to PAX. At least Udon should be there. Oh dear sweet mother of mercy, please don't let there be a crossover. ;. ; I know that Sonic is also written by Flynn, but I was hoping he didn't stoop to crossing the two franchises over. I really dislike Sonic. I hope this is just speculation, but if it isn't, well, nothing I can do about it. This is just my opinion. Y'all can get mad about a crossover all you want, but I've been wanting and Mega Man/Sonic crossover since I was literally 7 years old(I'm 28 now). Best believe I'll be buying like 3 freakin' copies of the damn thing. And as for a crossover... No thanks, personally. I mean, I'm fine with crossovers if they're in the form of ___ vs Capcom, or ___ x Capcom, but not in the form of this. I don't know how I and they mixes it in this crossover? Are they friends or mistakenly foes at first? What kind of relationship they and their friends are when they encounter with each other? Mega Man, the world's strongest robot relying on is buster and Sonic, the world's fastest heghehog relying on his shoes, how they fight each other or teams up against their nemesis. At least the only common are the baddies like Dr. Wily and Dr. Eggman (or Robotnik) who they possibly unite their forces against them. How they perform this? We'll see how they perform it and the outcome of this. As long as the crossover is separate from the main canon, I'm game. Okay so I'm a little guilty of it too, but I'm just saying.